In the first of a two-part assessment of its growing role on the world stage and dubious influence on Middle East and Arab politics, Paul Alster looks at Qatar's carefully crafted image that masks the real direction of this autocratic nation. In part two he concentrates on Qatar's on-the-ground financing of Islamist militias and revolutions in the Arab world. Haifa, Israel - Sometimes the most stunning deceptions occur in broad daylight. It's the classic ruse of the pathological manipulator; the hugely successful benefactors of a myriad of good causes such as disgraced financial moguls Bernie Madoff and Allen Stanford. The State of Qatar falls into a similar category. The Arabian Gulf island nation has insinuated its way to the top table of world affairs through financial muscle established on rich natural gas and oil reserves. Qatar has befriended and works closely with some of the most powerful nations (including the United States), and has established a series of high-profile charitable foundations and outstanding world-leading brands, while at the same time, it has brazenly sponsored terrorist entities across the Arab world and beyond. For a tiny country, it has ambitious aims to advance the global Muslim Brotherhood and promote Sunni Islam in its fight against Shia. But that agenda attracts little attention. Qatar has promoted and financed the cause of the Islamist opposition forces that overthrew Muammar Gaddafi in Libya, the Muslim Brotherhood in Egypt, has promoted the now-ruling Ettafdid Movement in Tunisia, the FSA in Syria, and most recently, has supported the rebel forces in Mali. "I think the U.S. is less aware of this [than it should be]. I mean it's hard to miss! It really has been ignored or shunted aside," Professor Ze'ev Magen, Middle East Studies chairman at Bar Ilan University, told the Investigative Project on Terrorism. "There is a constant attempt to attribute the breakdown [of the previous Arab status quo] to other factors," Magen said. "But in the end, what you see is the Iraqis, Syrians and the Lebanese Shiites, all lining up together with Iran, and then you've got the Sunni world that is most prominently represented by the Wahabbi Islam of the Gulf States [including Qatar] and the Muslim Brotherhood working together on the Sunni side." Qatar's generosity in helping Egypt during its current critical financial difficulties will not be without payback, Abdel Rahman Youssef, an Egyptian journalist specializing in political and religious affairs, wrote last month for the Lebanon-based Al Akhbar website, adding that Qatar may have its sights set on acquiring the Suez Canal and the Suez industrial zone currently owned by the Dubai Ports. "It should come as no surprise that today the canal looms large over many of the serious discussions concerning the future of Egypt and the entire region … The Gulf country's [Qatar's] economic reach inside Egypt was apparent in recent statements by Qatari Prime Minister Hamad Bin Jassim. 'Qatar will not let Egypt collapse economically,' he said. Qatar provided Egypt with aid and a deposit of around $5 billion. However, this all pales in comparison to rumors that the Qataris wish to acquire a large portion of UAE's investments in the Suez region." Suez journalist Sayyed Noun added "The street will not easily accept the news since many believe that Qatar wants to 'strangle the Canal.'" In February, Al Akhbar also reported that Qatar's alleged support of the Islamist rebels against the local troops in Mali and their French allies may have prompted France to block a major international telecom deal with Qatar. "Indicating a rift between the two allies, France stood in the way of Qatar's purchase of the company Vivendi Africa, a telecom giant active in North and West Africa. The obstruction of the sale occurred after word emerged that Qatar is possibly supporting jihadi groups in Mali." Correspondent Al Mokhtar Mohammad wrote. "The sale could hinder France's ability to surveil jihadi communications, especially since there are parties within France that have accused Qatar of supporting Mali armed groups." Qatar has been a refuge for terrorists – providing 9/11 mastermind Khaled Sheikh Muhammed a base in the 1990s – and now hosting recently re-elected Hamas leader Khaled Meshaal. On April 5, the Pakistan Daily Times reported that Qatari capital Doha is to host a new regional office for the Taliban with the blessing of Afghan leader, Hamid Karzai. 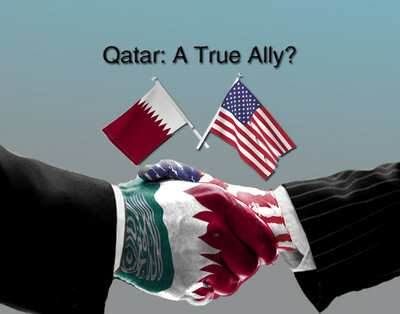 Qatar manages to maintain a very close relationship with the U.S. despite this situation. The massive Al Udeid airbase is on Qatari soil even though the U.S. has other good friends in the region such as Bahrain, Kuwait, and Saudi Arabia, on whom they could rely. According to a Wikileaks cable reported back in 2010, one man who long ago saw through Qatar's carefully crafted public image is Meir Dagan, former head of Israel's Mossad security agency, who told American diplomats, "Qatar is trying to cozy up to everyone. I think that you should remove your bases from [Qatar]. [The Qataris] owe their security to the presence of the Americans]." The seemingly limitless pretentions of its Wahabbist autocratic ruler, Sheikh Hamad bin Khalifa al Thani are furthered under the guise of promoting 'democracy in the Arab world.' That's ironic, given that Qatar is ruled exclusively by members of one family who rigidly control all media and outlets to free speech. When Sheikh Hamad overthrew his own father in a 1995 coup, he initiated a gradual transformation placing Qatar at the center of world affairs. One of his masterstrokes was the funding and creation of Al Jazeera, the hugely successful mouthpiece for his regime that has changed many people's perception of events in the Arab world to subliminally reflect the opinion held by the ruling Qatari family. Al Jazeera attracted a roster of high profile, well paid and talented international journalists. As it grew, the independence of the original editorial line and the creeping replacement of secular staff with Islamists became ever-more apparent. By 2011, as the 'Arab Spring' gathered pace and Qatar's behind-the-scenes role in the revolutions needed to be even more carefully stage managed, Sheikh Hamad replaced Al Jazeera's long-time editor Wadah Khanfar, a conservative Islamist whose ties to the Muslim Brotherhood had prompted his arrest in Jordan, with an even more hard-line man at the helm, his own royal cousin, Sheikh Hamad bin Thamer al Thani. Al Jazeera staffers started to despair during Khanfar's tenure. In June 2009 the Jerusalem Post Magazine reported, "The meteoric rise of the network and its increasing popularity have led many political and media commentators in the Arab world to wonder exactly who or what was behind what appears to be its main purpose: encouraging opposition and promoting incitement against Arab regimes, exposing the corruption of their leaders and their entourage, while holding to an extreme Arab nationalist attitude against the US and Israel and extolling the values of conservative – and sometimes extremist – Islam. It did not take long for one name to emerge: the Muslim Brotherhood." A series of cables from the U.S. embassy in Doha, published by Wikileaks, reflected the way Al Jazeera promotes Qatar's world vision, while the government stifles dissent in its own backyard. "The Qatari government claims to champion press freedom elsewhere, but generally does not tolerate it at home," the U.S. embassy in Doha reported in June 2009. Around this time, Robert Menard resigned as director of the Doha Centre for Media Freedom, together with a significant number of staff, after facing unprecedented interference in his work. "But certain Qatari officials never wanted an independent Centre, one that was free to express its views without being limited by political or diplomatic considerations, one that was free to criticise Qatar itself," Menard said. "But how can you be credible if you say nothing about the problems in the country in which you are based?" In January, Al Jazeera purchased former Vice President Al Gore's Current TV. This acquisition gives it a ready-made platform in the United States to promote Qatar's version of events in the Middle East, prompting expectations of it subtly (or unsubtly) guiding viewers towards its support of and praise for the International Muslim Brotherhood, as well as its persistent criticism of Israel. As Sultan Sooud al Qassemi of the respected Al Monitor website noted in June 2012, "Al Jazeera Arabic's love affair with the Muslim Brotherhood was clear from the channel's beginning. And since the Brotherhood decided to run a candidate for the Egyptian presidency, the channel has blatantly promoted him. What viewers end up with is propaganda, and it's damaged more than one revolution." As an example, al Qassemi wrote: "On June 22, 2012, Al Jazeera's correspondent Ayyash Darraji interviewed a woman for three minutes and allowed her to criticize former presidential contender Ahmed Shafiq without any interruption. As soon as the lady said one critical word about Morsi, he pulled the mike and cut her off." The network's expansion also targets Europe. "[Al Jazeera is also] preparing to launch a news channel in Britain while studies are at an advanced stage for a French-language channel," Middle East Online reported in March. "You're not going to find objective reporting there [Al Jazeera] almost ever," Magen told the IPT. "I don't know who exactly is watching Al Jazeera? I guess they think they're getting an inside picture of the Muslim world, but what they're actually getting is the inside picture that Qatar – a conservative, Sunni Muslim hierarchy – wants them to get." Qatar's relationship with Israel changed dramatically after it supported Hamas in the Israel-Gaza war. Relations were relatively good before that, with Israeli leaders Shimon Peres and Tzipi Livni visiting Doha in 2007 and 2008. "Qatar decided in 2009 to sever all ties with Israel and it has since been a very vociferous proponent for any anti-Israel group from Hamas to Syria," Israeli Foreign Ministry spokesman Yigal Palmor told the IPT. "There are no relations to speak of." "If there is anything that Qatar wants to do – rather than spread hatred and ignorance as it usually does – that would be to spend its money on peacemaking," Palmor added. "That would be a welcome change." Sheikh Hamad bin Khalifa al-Thani recently began refocusing his attention and inflaming passions in the Israel-Palestine conflict, while portraying himself to the international community as an honest broker in regional affairs. During an Arab League meeting last month, he called for a $1 billion Jerusalem fund to support programs that would "maintain the Arab and Islamic character of the city and reinforce the steadfastness of its people," the Gulf Times reported. Hamad pledged $250 million from Qatar and expects the balance to be contributed by other Arab states. "(Jerusalem) is in serious danger, which requires of us serious action. Palestinian, Arab and Islamic rights in Jerusalem cannot be compromised. Israel must realize this," Hamad reportedly told Arab leaders. In a typically chameleon-like maneuver however, Qatar recently hinted at its interest in investing in Israeli hi-tech companies, dangling a carrot under the noses of potential Israeli businessmen currently facing a reducing pool of international corporate investors. Israeli government officials suggested such news should be treated with plenty of caution. Qatar's latest move designed to portray itself to the Arab world as the flag bearer in the fight to make Jerusalem Palestinian is its bid to oust Canada – a staunch supporter of Israel - from its long-standing role as home of the UN-body, the ICAO. Since 1947 the International Civil Aviation Authority has been based in Montreal, but Qatar has seized upon Canadian Foreign Affairs Minister John Baird's recent visit to east Jerusalem to push to replace Canada as host of the ICAO. Baird met with Israeli Justice Minister Tzipi Livni on what the Arab world considers occupied land, a gesture that has angered many Arab nations and given Qatar a golden opportunity to rally regional support and to push for a vote to transfer the prestigious body from Montreal to Doha. Canadian Foreign Affairs Minister Joseph Lavoie called Qatar's prime minister twice last week, promising to "'fight tooth and nail' to keep the ICAO in Montreal – and he won't change his tune on his visit to east Jerusalem," the Globe and Mail reported May 2. Sheikh al-Thani irked the U.S. and many others in October when he became the first world leader to visit the Hamas-controlled Gaza Strip officially and deliver a $400 million donation. Yet despite the clear evidence from the leaked diplomatic cables displaying private doubts as to the sincerity of the Qataris, the U.S. appears to have no plans of reviewing its relationship.